This handy little machine uses standard ice cubes to make shaved ice quickly – it can make enough ice to fill up to five cones per minute. And operates with a simple on-off switch, so it’s simple enough for anyone to use. All of the parts that come in contact with food are BPA-free and the ice bin is removable for easy cleaning – but since you’re just running ice through it, you can just wipe it dry and tuck it away. This is small enough to fit on your counter or store easily when it’s not in use and the bright red color is festive. This has a pop-out tray that holds four cones, which makes filling them easy – or use it for serving the finished cones. The ice maker includes four reusable cones, which are great for family treats at home, plus 12 disposable paper cones for eating on the run. Recipes are included, but if you want pre-made syrups you’ll need to order them separately while you’re getting extra paper cones for serving at your next barbecue. You might wonder if you really need a commercial quality ice shaver, but if you have a lot of use for shaved ice for the kids, for parties, for adult drinks or for making ice packs, it makes sense to get a sturdy machine that produces shaved ice quickly and will last a long time. This machine can make up to 440 pounds of shaved ice per hour, so you’ll have no trouble keeping up with the demands of the neighborhood block party or filling coolers with crushed ice for picnics. Sure, that might be more ice than you’ll ever need for a quick dessert at home, but it gives confidence that this will last a lifetime. This has an industrial look that is attractive, but not as cute as the machines built with parties, kids and home users in mind. Operation is easy – just drop standard ice cubes in and push the handle. Dual blades make short work of the ice and ensure that the ice is completely shaved with no errant chunks. The on/off switch has a waterproof cover for safety and the large hopper means you won’t have to feed just a few cubes at a time. This festive machine includes everything you need to get the party going, with no need to shop for extras. It includes three, 16-ounce bottles of shaved ice syrup (cherry, grape and blue raspberry) that the manufacturer says is the same brand used at many shaved ice stands, so you’ll have the authentic flavor at home. It also includes 25 plastic spoon straws, 25 paper snow cone cups and three pourers for the bottles that make serving easy. To operate, just press on top to start shaving the ice. By pressing harder or easier, the texture of the shaved ice changes, so it might take some practice to figure out exactly what texture you prefer. Two lidless containers are included for making ice “pucks” that fit into the machine. Each puck makes about two cones, so it’s advised to make the pucks in advance and store them in a zip-top plastic bag in the freezer, so you’ll have enough on hand for a party or a snow cone emergency. Since the containers don’t have lids, they can’t be stacked in the freezer (and you need to place them where they won’t tip). This machine can also use standard ice cubes, but the finished quality won’t be quite as good. The design of this snow cone maker resembles an old-fashioned push-cart, with two wheels, two legs and a handle – but it fits neatly on your kitchen counter. It’s playful, but the white and gold coloring adds some class. The ice collects in a clear enclosed bin that holds enough for about 20 snow cones, while a shelf in front holds two cones for filling and serving. The machine uses standard ice cubes and turns on when the lid is locked in place, which makes it very safe to operate. Each ice refill makes enough shaved ice for about three snow cones in about 30 seconds, so no one will be waiting long for their treats. This comes with two reusable plastic cones and an ice scoop, but it does not include flavorings. An upgraded kit is available that includes spoon straws, paper cups, two flavorings and a squeeze bottle. The Snowie company is a maker of commercial shaved ice machine that cost thousands of dollars, so they’ve included some of those commercial features into this machine that’s designed and priced for home use. 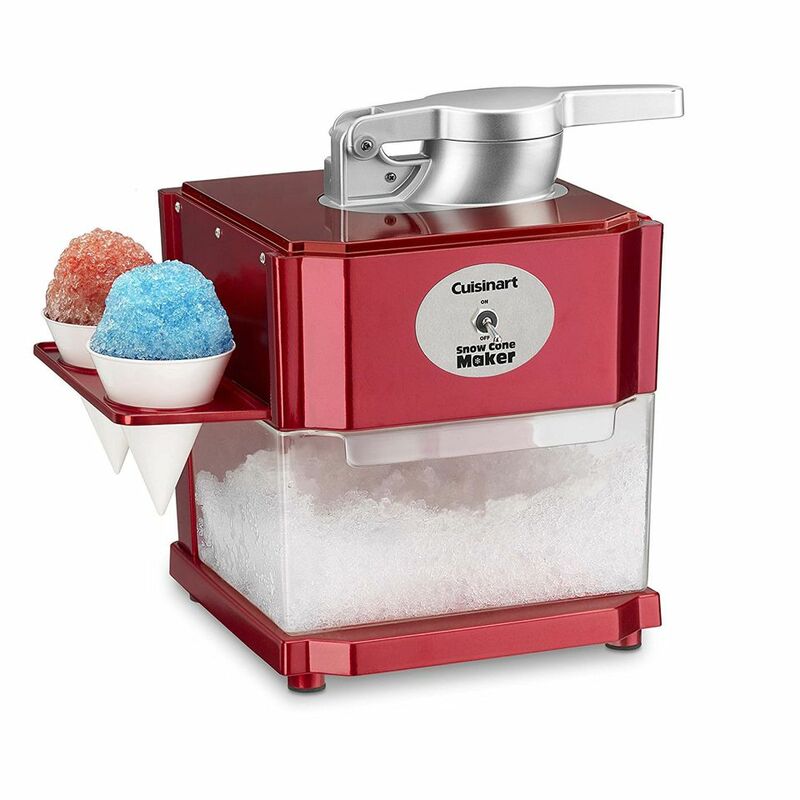 It makes enough ice for a single snow cone in about three seconds and the angled dispensing system lets you fill the snow cone directly and create the familiar domed top with ease. Of course, if you don’t want to fill cones, just put a bowl under the chute to collect ice. This uses standard ice cubes, so you don’t need to freeze special shapes and it’s designed to look at home on your counter, right next to the coffee machine. This includes six sample-sized bottles of syrup to get you started, but you’ll likely need to buy more to keep the party going. It also includes eight reusable and dishwasher safe “Snowie Shovel” spoons. This is the second version of this machine, and users have noted that it is definitely an improved model. This manual ice shaver means you can make snow cones wherever you go, as long as you have ice on hand – so bring the machine, pack your cooler with ice and make snow cones on a picnic, at the beach or in your back yard. This includes three lidded ice molds for making the ideal ice shape for use in this machine, but you can also use regular ice cubes. The molds are stackable and the lids keep them from spilling in the freezer, so you won’t make a mess if you bump them while reaching for the frozen peas. For big parties, make the ice ahead of time and freeze it in zip-top plastic bags. This relies on human cranking to shave the ice, so it might not be ideal for making snow cones for the entire neighborhood, unless everyone’s taking a turn shaving their own ice.